There were some hilarious parts of this story. Especially when we meet Virginia for the first time. And then there is my favorite line in the entire book, "I had to spend the evening with people I wouldn't usually be caught dead with – well, eventually I guess I would, as they all worked in the medical profession." I'm sure you have to read the rest of the scene to really get the line but it was awesome. While I loved Virginia and found Brynn quite amusing for the most part, I can't say that I cared much for Gill (the best friend). And the so over-the-top comments and thoughts that Brynn had about Gill showed just how much she loved her friend, even though she didn't love her in quite the same way, but toward the end, it simply because tiresome because the point had been so clearly made already. Overall the book was okay, but it was soooooo focused on the best friend relationship that we didn't even meet the real love interest (or go to the party, which was the 'big deal') until over halfway. We barely got any interaction between the two new women and I really felt like there could've been more comedy and romance there than being so focused on the friendship side of things since it was really sad to see how much Brynn longed for something she couldn't have when the book was supposed to be more of a rom-com. 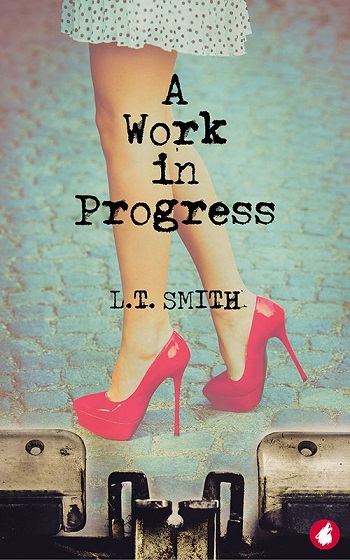 Reviewers on the Wicked Reads Review Team were provided a free copy of A Work in Progress (Window Shopping Collection #2) by L.T. Smith to read and review.